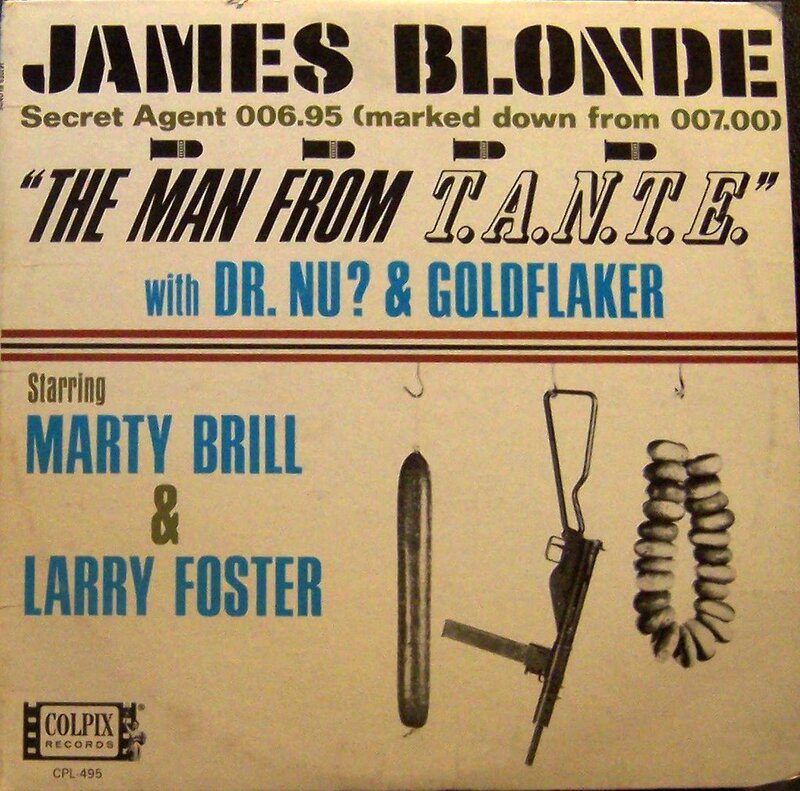 Way Out Junk: James Blonde: The Man from T.A.N.T.E. James Blonde: The Man from T.A.N.T.E. Well, I'd hoped to get this one on to coincide with the opening of "Casino Royale", but I'm a bit late on it. Since a number of articles were referring to Daniel Craig as "James Blonde", I figured this would be a perfect fit! My Dad bought this for us when we were kids. I'm not really sure why because it's not really a kids record. 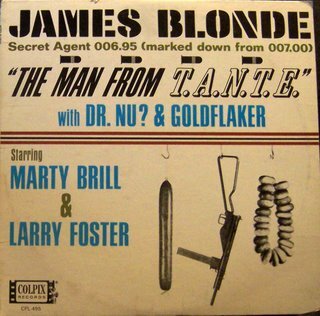 This album (copyrighted 1965 but I know we got it a few years later) has James Bond (excuse me, Blonde) as the Man from T.A.N.T.E. (To Annihilate No-good Troublemakers Etc.) going up against Dr. Nu? and Goldflaker from T.R.A.F.E. (Terrible Rotten And Filthy Enemies). This comedy album is loaded with Jewish references, which might temper how many of the jokes you get. As I kid, I just liked the funny voices. As a number of articles talking about this record point out, this album cast M as a woman long before the movies did. However, in this case M stands for James Blonde's Mama who insists on calling him Jake. ("You may be James to the world, sonny boy, but to your mother you will always be Jake!") This definitely qualifies as Way Out Junk! I hope you enjoy it, and for those of you who want more kids albums, don't worry. I've got three or four of them I'm working on right now! On Fire Island with Dr. Nu? UPDATE: I'm afraid I was forced to remove the link for this album, but you can buy the record on Amazon by following the link below! love this, I have the album but you did a great conversion to mp3...the only problem is that you missed the explosion in the first clip. you got the running up the stairs part and breaking into the service but no boom sigh. I've got a copy of this too, which I've inherited from my parents. It's a shame that both the All-Music Guide, and Amazon.com won't add all the correct info about this album, no matter how often you send them the info.